We are a volunteer organization of cat owners/handlers/guardians who believe in the value of animal-assisted activities and who provide therapy to people in need. 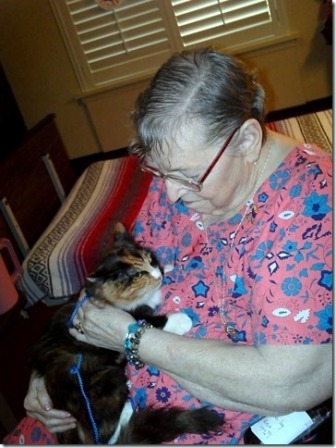 I-CAT seeks to be an educational resource on therapy cats, providing support and information to cat therapy teams, facilities interested in cat therapy visits, and the larger animal-assisted therapy community. I-CAT’s mission: increasing the number of therapy cats world-wide through education, networking, and advocacy. Animal-assisted therapy (AAT) / animal-assisted activities (AAA) involve trained animals in a healing practice to improve physical, emotional, and social wellness. Research shows that the presence of an animal facilitates relaxation and stress reduction, thus promoting healing. Animals can also provide a non-judging, non-verbal presence that allows them to reach out in a way that human providers cannot. In addition, the process of caring for animals improves fine motor skills and social interaction. There are many therapy animals in the United States ranging from dogs, cats, horses, llamas, birds, guinea pigs, and rabbits. I-CAT involves members who have registered (or are working to register) therapy cats through various national organizations (Pet Partners or Love on a Leash), local regional organizations, and those who do independent therapy cat work. We have members from across the US and the world including: Connecticut, Illinois, California, Minnesota, Vancouver, Germany, and New Zealand. This website is not an endorsement of any particular AAT registering organization, training technique, or method. Rather, it provides multiple perspectives and resources for those who work with or are interested in working with therapy cats.